This design is free from the Skacel website. :"In medieval times a baron's home was his castle. Of a winter's evening he might sit in his great chair in front of the fire enjoying its warmth. Above the fireplace the head of a great stag would hang, its antlers gleaming in the fire's glow. 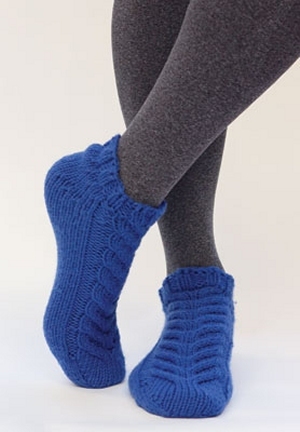 Although these days we might prefer to see our stags alive and in the wild, we can still sit by the fire and enjoy these comfortable slipper socks with their Stag Horn Cables emblazoning the foot." This design is free from the Skacel website. Remember to download or print the pattern by following the link provided on this page, as it will not be shipped with the yarn. Size US 7 - 32" circular needles, a cable needle, and a tapestry needle are required but not included. Gauge: 18 sts and 26 rows over 4"
$16.00 -- Kit price including yarn only (no book or pattern).